When the yeast has converted as much sugar as it can into alcohol, the fermentation will slow down. When there is no evidence of bubbles rising from the liquid it will start to clear. Once the liquid is clear the wine needs to be drawn off from the yeast sediment. The racking process is an important factor in the production of a quality wine. 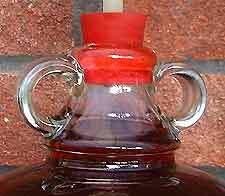 The first racking should be done by splashing the wine into a clear demijohn. Top the bottle by adding spare wine or cool boiled water. Splashing the wine into the new jar will encourage some aeration, and some more yeast will grow and this new yeast will feed on any haziness that may still be present. The wine should be racked again after approximately two months. Many winemakers add a half to one campden tablet prior to the second racking, while others prefer a lesser quantity. Only the first racking should be splashed into the new demijohn and additional rackings should be done quietly without splashing. After one month, if the wine is dry, bright and clear with no sediment, it can be bottled. Sweet wines will need more than two rackings to ensure stability. Demijohns must be topped up every time the wine is racked, therefore it is useful to make a little more than a gallon of liquid to start with. It is useful to keep liquid left over in a wine bottle plugged with cotton wool. This is ideal for topping up when the fermentation slows down, or during racking.